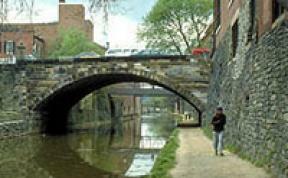 The C & O Canal is one of the most well-preserved waterways from the canal-building era of American History. Much of the aqueduct is lined with small footpaths for a closer inspection of the history held within the bricks and mortar. The canal is over 180 miles long, so chances are you won't have to go too far to find a piece of it for a romantic or historical journey.